Pours a pale yellowish straw color with a bright white head. The head is very soapy for a wheat beer and diminished very quickly. After just a few minutes the head has completely disappeared. It still seems to be highly carbonated; there are lots of tiny bubbles rising up from the bottom of the glass. Nice wit aromas on the nose. Sweet and somewhat caramely but with those classic banana and spice maybe even coriander notes are there. It’s one of those beers that you hope tastes as good as it smells. Very smooth and drinkable beer. You are first hit with an almost caramely malt taste then the high combination gives an almost cleansing effect over the tongue and you finish with a very pleasant almost citrus flavor, not quite lemon but some citrusy notes. This is a very nice and easy summer beer. Let’s see what happens to it as it warms up a little. This is interesting, it’s maltier tasting then most wits maltier as in more of a barley malt flavors rather than the more subtle grainy wheat flavors. It’s not bad at all just a little out of the classification of a witbier or wheat beer. Well the beer is now at 61 degrees and it continues to hold its own. This is a very easy drinking beer even when it warms up. There is a little more harshness as the beer warms and flattens a little but that is to be expected on many beers. I have to give this beer a good recommendation, it is a very easy drinking and refreshing beer it may be a little sweet for some but all and all it is a good beer. As for a letter rating that’s more difficult because this beer does not fit the normal criteria of a Witbier. 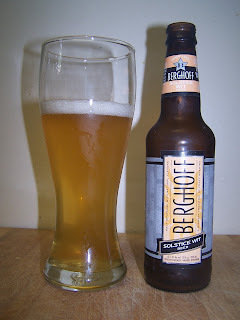 A Witbier typically indicates a Belgian White or wheat beer. This beer falls way short to compare it to that. The American wheat beers are a little less defined and open to more interpretations. Don’t get me wrong I really liked this beer it’s just not easy to rate it by its category. For a Belgian it would get a very low grade a D at best. For an American wit I can go as high as a C+. I try not to find out too much about the beer before I review it so it does not give me a bias in judgment. I really do not know what their intensions are. I highly recommend this as a good summer beer. Taking it out of the witbier category it would rank up there with a lot of good summer beers. It’s a good clean refreshing summer beer comparable to Samuel Adams Summer ale and others of that type. Not a high end craft beer but a good drinkable summer ale. Hey, just in case you were interested here in the BierVlog review of Solstice Wit. I was on the edge of my seat waiting for the lightning to strike. Johnny's hair to stand on end and the screen to go black. Very Very scarry.